There are 7 Assisted Living Facilities in the Mandeville area, with 3 in Mandeville and 4 nearby. The average cost of assisted living in Mandeville is $3,483 per month. This is higher than the national median of $3,346. Cheaper nearby regions include Covington with an average starting cost of $3,383. To help you with your search, browse the 57 reviews below for assisted living facilities in Mandeville. On average, consumers rate assisted living in Mandeville 4.4 out of 5 stars. Better rated regions include Covington with an average rating of 4.5 out of 5 stars. Caring.com has helped 5 families in Mandeville find high-quality senior care. To speak with one of our Family Advisors about assisted living options and costs in Mandeville, call (855) 863-8283. Mandeville, located on the north shore of Lake Pontchartrain, has a population of around 11,000 residents, 11.4 percent of whom are age 65 or older. Seniors in the area will find 12 assisted living facilities (ALFs) to help them with daily tasks as well as give them a warm, friendly and secure place to live. The Louisiana Department of Health is charged with regulating Louisiana (ALFs). Such facilities are defined by Louisiana state law as those housing two or more unrelated residents in need of assistance with personal care and daily tasks. The Mandeville, Louisiana area is home to world-class medical facilities including Oschner Health Center and Lakeview Regional Medical Center, in the event of medical emergencies or illness. Living in Mandeville costs a little more than it does in other parts of Louisiana and the United States, and the overall cost of living in Mandeville is 8 percent greater than the national average. However, the average cost of utilities and groceries are actually less than the national average, which is helpful to seniors living on a fixed income. Mandeville's sub-tropical climate means that the city experiences hot, humid summers and mild winters. The average high temperature in Mandeville in January is 62 degrees Fahrenheit, and the average high temperature in July is 91 degrees Fahrenheit. Crime isn't nearly so much of a problem in Mandeville as it is in many other cities in Louisiana. In fact, the crime rate in Mandeville is 16 percent lower than the national average, making it safer than nearly half of American cities. For trips out of town, I-12 runs just north of Mandeville. For trips within the city, the St. Tammany Transportation System (STAR) offers on-demand service Monday through Saturday. Residents, age 60 and older, ride for free (7:00 a.m. to 2:30 p.m.) when they register for the COAST program. There's plenty to see and do in and around Mandeville, Louisiana. Just a few of the many cultural attractions in the area include the Mandeville Trailhead Cultural Center, Northlake Nature Center and the Children's Museum of St. Tammany, a great place to take the grandkids. Assisted Living costs in Mandeville start around $3,483 per month on average, while the nationwide average cost of assisted living is $4,000 per month, according to the latest figures from Genworth’s Cost of Care Survey. It’s important to note that assisted living rates in Mandeville and the surrounding suburbs can vary widely based on factors such as location, the level of care needed, apartment size and the types of amenities offered at each community. 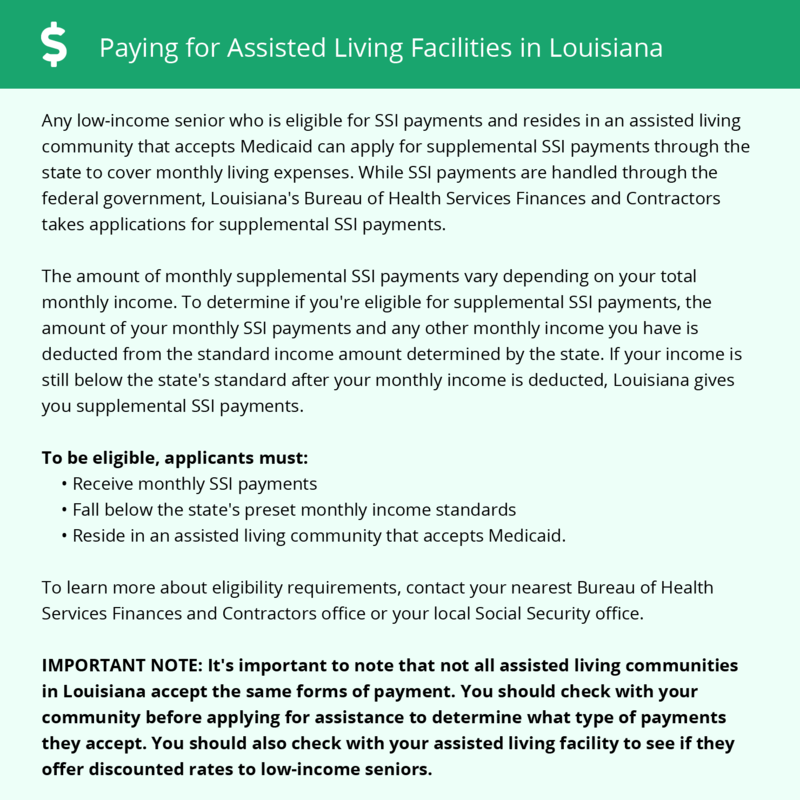 Eligible Mandeville, Louisiana seniors can find a number of state and federal assistance programs to help with the cost of an ALF. These include the Community Choices Waiver (CCW) and Supplemental Security Income Category G.
To see a list of free assisted living resources in Mandeville, please visit our Assisted Living in Louisiana page. Mandeville-area assisted living communities must adhere to the comprehensive set of state laws and regulations that all assisted living communities in Louisiana are required to follow. Visit our Assisted Living in Louisiana page for more information about these laws.